When you want to make amazing music in a portable environment, there's nothing that quite gets the job done like a MIDI keyboard controller. For a musician, this type of device provides the ideal way to assemble a compact music production system. You need to be sure though that you choose a MIDI controller that will meet your needs, expectations of quality, and music-related preferences so that you get the most use and pleasure out of it. If you are new to the MIDI market, a few of your first questions will likely be: 1) What is MIDI? and 2) How does the sound device work? Ahem, let us explain. Shagadelic, as Austin Powers would say. MIDI stands for Musical Instrument Digital Interface. It is the universal standard by which keyboard controllers, software, computers, and multiple electronic musical instruments, called synthesizers, connect to use musical data. Typically, a MIDI-enabled keyboard controller has a piano style user interface. It sends MIDI information via a USB cable to other devices connected to the same interface. The keyboard itself does not produce sound but instead sends the MIDI data to an electronic module (either a synthesizer or a computer) that reproduces the digital sounds. When using the leading MIDI keyboards available today, the waveforms sound almost the same as classic analog musical instruments. The digital audio is often referred to as voices or timbres. With the single keyboard, you can control several electronic instruments. Perhaps you use the lower controls as the drum machine and the upper register as a Moog synthesizer. Use the controller to send out messages of MIDI data to create the sounds you want to play, within DAW software, and through a mix of hardware. MIDI controllers come with several knobs and faders so you can control the instruments that you want to imitate. Here is more about the features of MIDI keyboard controllers, from the octaves to the key quality, that separate the mediocre ones from the higher quality varieties. Figure out how much space you have for the keyboard by using a tape measure. Doing so will right away limit the amount of controllers from which to choose, such as whether you will get one with 25, 37 or 49 keys. These are the typical sizes, although you can go bigger if you have the room. Some controllers do offer smaller keys so you can fit more keys within a smaller sized model. Keys in a MIDI keyboard controller can be weighted, semi-weighted or unweighted. The "weight" of the keys is added to simulate the different sounds that heavier keys make on a real piano. Compact models won't typically have weight to them because usually you want to play them quickly. However, when the keyboard size increases, it may seem "springy" to play them, so then most users opt for semi-weighted varieties to get both speed and depth of sound. If the keyboard feels cheap when you touch it, you may not want to buy it. It's mainly a subjective thing but important if you plan to use the gear for long jam sessions or take it on the road with you. Plus, if it's flimsy and feels cheap, you probably won't get as long of a lifespan out of it as a better quality one. Also, check out the controller's velocity sensitivity. The cheaper versions often won't have this feature, so all notes have the same expression, which makes for limited abilities to build mood. If you invest in a keyboard with velocity, then the harder you play it the more velocity you will get out of certain notes and you get good musical expression in your performance. Tweak your sounds, alter DAW, and control the synths with knobs, faders, wheels, pads, and other controllers available on the MIDI devices. For example, you can combine a soft synth with a certain DAW version with the hands-on control you get in a quality controller. It's in real time too, for a more authentic, analog feel than you get by simply clicking a mouse. As for when you crave percussion, you might be satisfied with using only the keys to get it but some users want more and, therefore, choose velocity-sensing performance pads instead. Use the pads for drum and trigger loops; there are usually at least eight pads on the latest MIDI controller models. Some pads can even sense aftertouch (another option you may want to consider). But remember, all of these controls take up valuable space on the top of your keyboard and also make the device heavy. So, keep in mind how much space you have for the keyboard, how portable you need it to be, and also your budget (the more options, the more moolah you will need to buy it, typically). Below is an in-depth guide to the most popular MIDI keyboard controllers. The five models, in order of discussion, are Nektar Impact LX61 61 Note, Akai Professional MPK Mini MK2 25-Key, CME Xkey 25-Key Portable, M-Audio Oxygen 49 4, and Korg microKEY 37-Key USB MIDI controller. While the Impact also comes in 25, 49, and 88-key models, this review focuses on the 61 synth key version. The 61-key USB-MIDI keyboard controller comes with pre-mapped DAW configurations for Studio One, SONAR, Reason, Garageband, Logic X, and more. It has eight velocity-sensitive pads, eight encoders, nine faders, and full transport controls. An awesome part of this controller is your ability to switch between instrument, mixer, and preset modes for a workflow that is so fast it blows your mind. The keys have a great feel to them too so you're comfortable as you spend long hours at your music workstation. The mod wheel and keys are smooth and velvety, with a great feel to the knobs, performance pads, and faders too. The MIDI controller is excellent value for the price point too at only $199. Lightweight and portable are two descriptions that many online reviewers use for this product, so it's a great choice if you plan to be on the go with your keyboard. As for the drawbacks, this controller is fairly basic in the visual feedback area. Also, it lacks any hardware MIDI ports, so that makes it difficult to set up external equipment that you may want to add to it. In summary, if you like a "plug and play" experience for your music production, the Impact will appeal to you. It comes preset with DAW configurations so you won't have to worry about the time-consuming process of inputting melodies and beats. Plus, you get more than just a 25-key version without breaking the bank. The Akai MPK mini is uber-compact, meant to take with you on the go. So, if you're a traveling musician or want a desktop producer, then the MPK will be right up your alley. It has high functionality, whether you want to record, compose, or perform with virtual instruments. Its features allow for high levels of creativity too! With the Akai MPK mini, you get all of the essentials you need to set up your musical foundation quickly and then expand on it. It's a cinch to operate with the plug-and-play interface. Plus, you can adjust melodic lines easily, even when you want to make those lines more intricate ones. Enjoy unique features too, like its joystick and MPC Note Retreat. It even comes with a pro software bundle, including Hybrid 3, so you can get awesome new sounds whether you're a musician or a producer. It is USB powered too. Unfortunately, some parts of the Akai Professional MPK Mini MK2 25-key keyboard could use some tweaking. For example, several consumer reviews online spotlight the weakness of the pads; these users explain the pads have bad hit protection. Also, while the compact design of the MPK Mini is handy, its keys are not full size and not weighted, which can limit user experiences and give it a cheap feeling. Therefore, if you want a compact keyboard controller that you can easily store, that runs via USB cable, and comes with basic features and software, then take a serious look at this Akai 25-key model. However, if you are looking for weighted keys with a deeper sound and don't care about the size of the keyboard, then you will want to consider one of the other options we present here. The Xkey 25-key musical keyboard from CME has Xcellent portability. With the ultra-slim 3.6mm edge and its lightweight body, you can easily tuck this keyboard in with your gear as you head out to a live performance. It has 25 standard-sized keys, as well as onboard buttons for modulation, pitch, octave, and the sustain pedal. The MIDI compact controller comes in a range of colors, from gold to neon blue. Perhaps the best part of this MIDI-compliant keyboard is that it is compact yet comes with regular-sized keys! That's pretty much unheard of in the industry as the trend is for smaller keyboards with downsized keys to accommodate mobile music-making. It is USB MIDI compliant and comes with professional velocity sensitivity. Also, the MIDI keyboard is multifunctional; use it for studio recording, creative composition, or for playing live. This keyboard is compatible with your iPad, Mac, and PC, which is really convenient. Unfortunately, to allow for the compact design with full-sized keys, the Xkey has had to do away with conventional controls for modulation and pitch bend. You still get these features but access them via pressure-sensitive pads instead. You won't get the precision like you would with other keyboards' more traditional style of knobs and sliders. Also, the keys feel similar to a computer keyboard, so if you prefer the feel of piano keys, then this difference may throw you off a bit, at least at first. Overall, if you want a keyboard that you can use quickly and multi-task between studio creation and live playing, then this MIDI-compliant Xkey keyboard is a great choice. It is affordable too, especially considering its pro features; it retails at about $100. If you prefer knobs and sliders dedicated to modulation, pitch, and octave though then you'll want a more traditional competitor keyboard than this one. For your mobile music needs, the compact Oxygen 49 USB MIDI controller is one heck of an innovator! The keyboard's prime real estate on top contains eight assignable knobs, nine assignable drivers, a dedicated transport button, and more. It is highly useful for both performers and producers, particularly within its lower price range, and it is easy to use too. As soon as you start using the Oxygen 49 from M-Audio, you will notice that the controllers are set up in a streamlined way so that you can take full control of your music session. Record and mix with high customization, thanks to the range of controllers. Enjoy the convenience too of DirectLink mode, which auto maps your controls to common DAW guidelines. You get the quality you expect from M-Audio, a pioneer of the MIDI keyboard controller, with a solid build and innovative software like Ignite that comes bundled with it. A drawback is that there are only three velocity settings, so it is a pain to try to get the velocity curve right. Also, if you have limited room for storage, the dimensions of this keyboard may be too big for you. In this case, it would be preferable to go with a more compact model, such as the CME Xkey. Therefore, if you want to mix and create new music, then you will likely appreciate the way you can customize the many knobs and drivers that come with this MIDI keyboard controller. You get a strong keyboard to pound on throughout your music sessions, even when they go long, and innovative software is included too. If you're looking for quality velocity, though, you'll find this 49-key controller is limited. This compact MIDI controller from Korg has 37 natural touch mini keys and is USB bus powered. It comes with both pitch and mod wheels, is velocity sensitive, and it has both octave shift and key transpose features. If you're looking to complete your production setup, then this model may be the one for you. While there are 25 and 61 key versions, this review focuses on the 37-key controller. The 37-key microKEY features natural touch keys that are also velocity sensitive. The keyboard is lightweight and ultra-compact, so just put it in your backpack as you head out to a live performance or a jamming session. You can express your creativity too with the pitch bend and modulation controllers, as well as the dedicated octave shift buttons. It's a plug-and-play device too, so it is easy to install when you want to crank out notes. Did we mention it comes with a USB cable and software editor too? At less than $100, that's a sweet deal. Of course, no product is perfect. The build on this MIDI controller, as with some other compact competitors, is a little flimsy. It could feel more stable, but then again it is a no-frills type of keyboard so you might be expecting too much from it. The keys lack a feeling of durability too, and the mini size can be taxing on those of us with bigger hands (on the other hand, some users do well with the Korg "waterfall-type" keyboard). If you want to do more complicated production work than sampling and triggering drums, then you might look for an alternative that offers more than this basic MIDI. But, if you want a compact, lightweight keyboard that comes with all of the controllers you need for songwriting, then you are all set with this microKEY 37-key model. Now you are armed with all of the information you need to make an educated decision as to which of the top five MIDI controllers are best for you. Keep in mind that all the models we reviewed here are meant for amateur musicians to use in the man cave or as compact gear that you can take with you on the go. Ultimately it is a personal choice because every musician or producer has different needs, skill levels, and expectations of the technology. But, overall, we do have a favorite here at Man Cave Master. OK, let us explain. The Korg microKEY comes out as the leader in our eyes for a player who wants an all-rounded keyboard to take on the go or for basic playing right out of the box. The runner up is the Nektar, a solid workhorse that adapts to your playing style and has great DAWs integration. So, why did the other three MIDI keyboard controllers come up short? Don't get us wrong, they all still have quality features, depending on your needs. But we had to take the Akai MPK Mini MK2 out of the running for the top spot because of its weak pads and for only having 25 keys. As for the CME Xkey, it also has just 25 keys and makes a clicking sound that we couldn't overlook in our review. The M-Audio Oxygen 49 is not compact in size, and its limited velocity was what ultimately kept it out of the top two positions. There you have it, all of the information you need to pick the right MIDI keyboard controller for you. If you got value out of this review post, please share! This iDevice gives you just about every type of iOS music peripheral that you can think of! In compact form, the IK keyboard is core MIDI compliant and USB class compliant, for an easy plug-and-play device. Enjoy 37 velocity-sensitive mini keys that are powered easily by your iOS device, Mac, or PC USB, as well as pitch bend and mod wheels. Want to get it now? Let’s face it, everything on the market really shouldn’t be there. Some things serve no purpose or are so “out there” that they resemble the likes of the Lunar Unicycle in our retro future post. Over the years, there have been products that we think maybe the inventors should have just kept to themselves. Here are 15 ads for products that never should have been invented. There’s nothing like taking cold headphones to bed – I mean, it’s such a problem! LMFAO. Since when are Hear Muffs solving a legitimate problem? On the other hand, we dig his mustache. Gotta look at the positive side, as mom always told us. Now comes the creepy. Giving cocaine to kids in the form of toothache drops might just be… Oh who are we kidding, it’s so wrong it actually makes us grind our teeth! Only 15 cents for the drops, back in 1885, what a deal (call the local dealer if you want more of them). Have you always wanted to get slender without exercise? Us too. But working out is probably way more productive than walking around in these unflattering sauna pants. They are literally a hot mess. Which came first, the chicken or the egg? That’s one question to ask. Another Q&A session could involve asking why anyone wants to cube an egg! Do you agree that this product should never have been invented? Look ma, no hands! Seriously though, if you don’t have time to hold your burger with your hand, then you might want to slow down a bit. Or at least get out of the fast lane on the highway. Thanks. If you use this alcohol-doused toothpaste in the morning, then you’ll be loads of fun at the board meeting later. Only $1 a tube, what a deal. Too bad this product shouldn’t have been invented. We’re going to have to go out on a limb here and say this kid might lose some of his limbs if he really uses this product. Don’t do it! Is it just me or do more people want their faces, rather than their spines, to be young? It’s not like we’d go up to someone and say, “Your spine looks so young!” It’s almost as awkward as the people who you’ll find in a CrossFit gym. We’re going to take a wild guess that Screme Formula wasn’t such a hit with men. No offence to the werewolves. Want to change your facial hair instantly? Stick “simulated natural hair” on your face. Another revolutionary idea is to take a few days and grow the hair yourself. Seriously, this product shouldn’t have happened. Maybe our hearts are jaded but that’s just our opinion. The 1970s was apparently an era of smoking pot and bronzing lips. 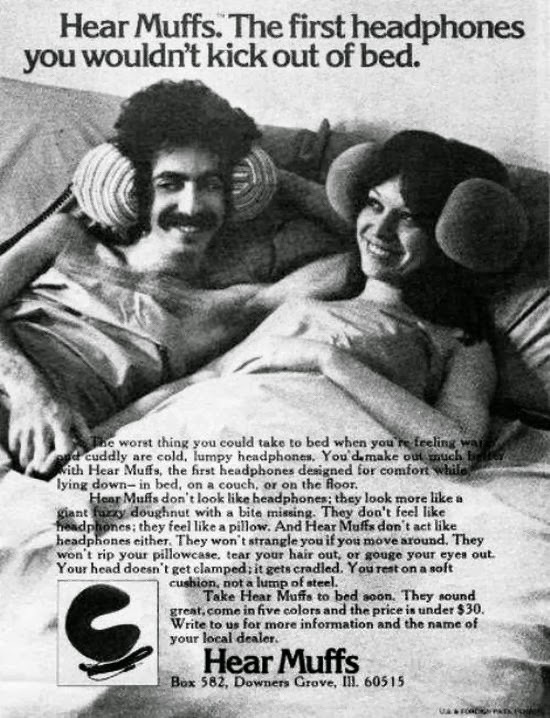 This product, shown here in a 1972 ad, takes creepy to a whole new level. Oh yes, wet cigarettes, what an issue… NOT. Somebody had too much time on their hands when they filed a patent for this product. The retro ad dates back to 1931. We love that there is even a regular service for the hair rental. Your hair shows up on time for you! When the ad asks, “What other company offers this?”, we’re at a bit of a loss for how to reply. People used to pay money for these products. Yes. Is it just us or are these vintage ads for products that never should have happened? If you come across any of the inventors, ask them what their motivation was. We would like to say there aren’t any silly, pointless products on the market today but, well, that would be a silly and pointless statement to make, now wouldn’t it? Foosball tables have been increasing in popularity recently and manufacturers are hustling to produce a plethora of options to keep consumers buying -- today making a good decision on a quality foosball table can be a tough call. A Full Sized Foosball table can cost any where from $200 for a lower end option to $1500 for the higher end non-coin-operated varieties. Additionally, the high demand for this entertaining luxury has made it common to see several foosball tables of the exact same make, model and quality bracket selling for prices that vary by several hundred dollars. Taking time to shop around can be very profitable. It would also be quite advantageous to do some research into the foosball table so that your decision comes from a good perspective. ManCaveMaster to the rescue: here are some of the basics to professional and recreational "Foosballing​". Did you know that in a Foosball Tournament, "spinning" the rods is illegal? This is important to think about before you purchase your table; this way you will know if you want to purchase a high-end premium table or a quality toy/game that would be a hit with the kids and provide some wholesome entertainment. Of course, if you want to add some prestige to your man cave - and price is not the deciding factor - you may want to consider buying a premium table. In order to begin honing the skills to shred with the pros, you will need a quality work of art with a consistent roll and this comes from a well crafted table, using matching quality materials. You will need a unit where the little figures, the surfaces and the ball have a consistent and even roll. That will allow you to apply such techniques as scooping, pinning and maneuvering the ball with precision and grace. Of course, a foosball table of this caliber is going to cost you upwards of $600. Even if you are purchasing a gift for children - and the gift is only intended as a toy - you may think that a premium table is overkill. But consider the additional investment in going premium might pay off in the long run. You may spend a couple hundred dollars or less on a so called "toy", but in the end you will have a premium grade table that will provide a child with an activity they can grow up with and develop skills on - along with the abilities and techniques made possible by precision quality. Another good reason for opting for a premium quality table is the kind of attention and company it attracts --and we are not talking about kids here. Adults are playful and competitive to. And a true skill game can consistently attract a die hard following of neighbours, friends, coworkers and relatives who show up to kick back and play ball in an environment that demands more grown-up skill than youthful vigor. Finally, Premium Tables will last you longer and can have damaged parts or components replaced as needed. Best Age Range For "Foosers"
This largely depends on whether you are buying a toy or an actual activity that can develop into a competitive skill. Kids as young 6 can pick up on the rules of this game and have a fun time knocking the ball around with their friends for countless hours - for smaller children a foosball table with adjustable legs would be ideal. (The official height of a foosball table is 36 inches). There are events, pro tours and other professional competitions that feature kids 17 years and older. There are also many kids in their early teens who have entered these competitions and won. This kind of hard-core gaming requires superior equipment. Then there are the really "big kids" with full beards, credit cards and adult level vernaculars - and levels of competition that require high-quality foosball tables to properly stand up to ongoing use and abuse. For high-level competition in the frat house, sorority basement or man cave, you are going to need a premium table. An official foosball table measures 30 inches by 56 inches. Don't forget, you will need plenty of room for the sticks that jut out from either side. The recommended room size is 7 foot by 8 foot. This will give you about a foot over the end and three feet over each side. For bigger, rowdier kids you may need a bigger room. There are also some very sharp looking varieties of Foosball tables and even some custom finishes to match the decor of your room. Is the Surface flat? Place a marble in the center of the field and check what happens. Did it roll this way or that? Does it have any irregular rolling patterns that could put games on a tilt? Check for any dead zones, especially in the corners where the ball may enter and be unreachable to the players. Some tables have adjustable legs so that they can be levelled out on any surface. Rough playing is an important part of entertaining Foosball, so you will want that the side walls are held together well and not going to be yanked apart by 13 year olds. Lower quality tables are usually held together with pegs and glue, while quality tables are fastened with sturdy brackets and even ornate metal framework. The thickness of the walls is also a measure of quality (but not always) a thicker wall is a good sign. There might come a time when you are ready to move on and sell your trusty table. If you were price-savvy in the first place, you should have no problem selling your table locally while still fetching a decent price for it. Taking advantage of websites for local listings as opposed to costly shipping across the country will increase your margin. As with anything, visible wear diminishes your resell value. One more reason the go with a higher quality grade table. For a detailed Foosball table review and comparison, take a look here. Which Is Better – A Cordless Drill Or A Drill With A Cord? Contractors, carpenters and handymen use both cordless and corded drills. As they both do primarily the same thing, one would wonder if there is a difference. The fact is they both work well, but are used in differing situations. One is an advantage as being convenient and the other gives more power for the job. Of course the cordless is much more convenient, but when it comes to power, the corded drill is the one to use. Consequently, a strategy of having one of each kind available in one's tool kit gives you the best of everything. For one thing, corded drills are lighter in weight because they don't have to carry any batteries and they are easier to handle as well. A cordless drill will always need a backup battery just in case the first battery goes dead. Down the road, the batteries will have to be replaced too, which can be quite expensive. Drills with cords do have more consistent power and for those difficult jobs there is no comparison. They provide more torque on a more consistent basis and they are much more reliable. Since there is a constant flow of electricity so there will be no limitation or barrier in the way of voltage. If a carpenter or a contractor has a choice of whether he will want to use a corded or a cordless drill, he will nearly always choose the corded drill. There is no question that a cordless drill will come out on top in terms of convenience. There are a number of features that cordless drills have that add to that convenience. A manually adjustable clutch and a reversible drive are two such features that come in handy. Magnetized bits and multiple speeds are very desirable on a cordless drill too. The power of the drill is directly relatable to the amount of voltage that is stored in the battery. The lower the voltage, the less power the drill will have. The big advantage of the cordless drill is the fact that you can take it with you wherever you go. It is very convenient since there is no cord to become entangled with other objects, boards and tools. They are used a lot for secondary drills by do-it-yourselfers, carpenters and contractors. Corded drills are preferred for jobs that require a lot of heavy drilling or serious driving, but the cordless drills are great for minor jobs in hard to reach locations. For jobs around the house, that are light in their scope, cordless drills are the ideal tool. With an extra battery that you always have on the charger, you are generally in good shape. It is very seldom too, that at home you will have very heavy drilling jobs, so a cordless is usually ideal for home projects. Both varieties of drills do serve their own purpose at the job site and in the workshop. Corded drills are excellent for those tough, hard-driving extensive jobs, and the cordless is great for those lighter jobs or around the house. Having to drag around a cord for lighter duty work is saved with a cordless drill. Having both available, depending on the type of work you do is a good strategy to employ. Take a look at our drill reviews for more information. Pneumatic Or Electric Nail Gun – Which One Should I Purchase? When trying to choose between a pneumatic and electric nail gun, opinions largely differ. We are trying to shed some light for you in the below breakdown of Pros an Cons. It is lighter compared to the pneumatic gun thus enabling you to use it for a long period of time without experiencing fatigue than you will encounter using an air operated nail gun. It is cordless. If you purchase a cordless electric nail gun, you will not have a cord or a hose to drag around behind you, which is not safe considering the fact that you are working in a hazardous environment. Operates with minimum noise - this is very important especially if you will be using it in a residential area. You do not need to buy a loud air compressor, therefore the operation of an electric nail gun is much quieter than that of a pneumatic nail gun. Low Cost-corded electric nail gun costs 25 percent less than a comparable pneumatic nail gun. Cordless nail guns, cordless electric nail guns however will be more expensive than a pneumatic one. Has no messy oils - all pneumatic tools require oil to ensure smooth operation, this is mainly done to prevent them from rusting and lubrication of the internal gears. Electric nail guns do not require any lubrication. if you are performing an in depth remodelling project, you may be required to turn off the power supply on the working site. That means that you will need some power cord extensions to ensure supply for your electric nail gun. With a pneumatic nailer, you simply need to plug your compressor to a power source and run a cord to the working site to ensure operation. most of the cordless and corded nailers have less impact power than what a pneumatic nail gun can deliver. This means that you may have to use a hammer to ensure that the nails are driven in to place properly. Electric nailers are more susceptible to damage, compared to pneumatic ones. Pneumatic nail guns are suited for a heavy duty construction because they are able to withstand the harsh environments. When you choose to utilize a cordless nailer, you will have to replace the batteries regularly. To ensure proper operation you are required to have three batteries. Cordless nail guns requires a lot of power to ensure proper operation. Thus it requires you to change the batteries frequently before they are completely dead. Utilizing these batteries for a long time decreases their efficient overall output thus limiting the amount of work it can handle. There you have it! If you are looking to purchase a nail gun, take a look at our framing nail gun reviews! The framing nail gun is among the numerous kinds of guns you can buy and add to your collection of woodworking tools. Utilizing a nail gun comes along with various options that make its purchase more warranted than any other nail guns you may come across during your window shopping. Many people who use hammers to complete a framing task think it is easy to use. The simple idea behind using a hammer is a no-brainer, but using it with great effectiveness is a completely different story. It is very easy to use a hammer because you just have to hold the nail in place and strike it on the head. Even if you are perfect at hammering nails, you might occasionally miss the head and smash one of your fingers. The nail may also go into the wood crooked meaning that you will have to pull it out and start a fresh. Additionally, the nail could bend when hit thus removing it will not be an option. The perfect solution for these problems is a framing nail gun. Here, smashing the woos with its nozzle removes the nail. You can also achieve the same by pulling the trigger. Result: no crooked or bent nails to deal with! If you are trying to complete a job on your own, a framing nail gun is the best options if you want the job done as quick as possible. If you have a team of multiple workers, you can reduce the work hours or have many tasks being done at the same time. The framing nail gun has a remarkable speed such that you can slice your team by almost half (but of course depending on the task at hand). This is a kind of woodworking tool that is built to last. This tool can withstand almost any condition ranging from falling off the roof to concrete and being left out overnight. It is its durability that makes it a perfect and smart idea to purchase a roofing nail gun. Similar to any other tools you opt to purchase, nail guns come in different styles and varieties that can easily meet your needs. The most common model is usually lightweight and accommodates more nails. This kind of framing gun has a drum holder where hundreds of nails can be stored. Additionally, this framing nail gun can offer various methods of firing in nails such as burst firing, single shot and bump firing. The manner in which the nail gun is powered varies and so does the price. The most common nail guns operate through compressed air, straight electricity or even battery power. Regardless of the gun you buy, you will be in a position to use it in any project that comes your way. Utilizing a framing nail will save you lots of cash since you will not waste any nails or need any extra manpower. The task will also be finished quicker so you can handle many jobs in a short duration. Take a look at our framing nail gun reviews for more details. The avid do-it-yourselfer clearly knows the benefits of a sliding compound miter saw. The tool is not for the timid; it is large but with a diverse usage. The saw comes with a sliding blade that enables it to cut various materials, doing 14î in width. The best thing about its features is the base and blade, which can be angled to do intricate cuts with ease. Different jobs require different blades; which is why it is vital to use the right blade when working with a sliding compound miter saw to avoid damaging the blade and add more years to its use. Part of ensuring that you are using the right blade for the job is ensuring that the blade is sharp. A blunt blade will vibrate and have too much friction that will cause it to overheat. Almost all sliding compound miter saws come with a locking feature. The user will position the saw at the desired angle then test it make sure the cut is right and adjust if necessary. Once the calibrations are correct, the user will turn a screw to lock the saw down to avoid the boards from shifting when cutting. It is important to avoid making the screw too tight because it can strip or break. An extension is important when using a sliding compound miter saw to cut long boards. Some sliding compound miter saw models have a slide-out extension while others have the extension as an additional accessory that is bought separately when purchasing the saw. The most ardent of do-it-yourselfers opt to get creative and build an extension for their tool. Regardless of the method of getting the extension, this is a necessary accessory that will help ensure corrects cuts when working on long boards. Use masking tape when cutting; it will help keep the wood from splintering. Just tape the area you plan to cut and then cut through the tape into the wood. Use good quality masking tape the will hold together the wood ends to stop splintering. Set the sliding compound miter saw at a 450 locking position when cutting crown moldings. Correctly measure and mark the molding for the furthest end to the other (lengthwise), flip the molding and place the saw as you ensure you reflect the mold on the wall. Place one end on the fence as you cut into the corners and have it on the table when cut the outside corners. You will need a coping saw to back-cut the profile. Afterward, draw a line of the fence keeping in line with the stock to help you repeat the positioning with ease. For more infos on miter saws, take a look at our miter saw reviews!